I am always looking for ways to make my life easier! I must admit – between the commitments of home and work, I find myself racing around and constantly running out of household essentials! For that reason, I was really interested in trying out the FINISH Quantumatic Dishwashing Detergent Dispenser. I appreciated the fact that this product would make my life easier in two different ways – I wouldn’t have to pre-wash my dishes (which would save me time) and the dispenser allowed for multiple uses so I wouldn’t find myself running out of dishwasher detergent when I had my dishwasher full! When the the FINISH Quantumatic Dishwashing Detergent Dispenser arrived, I read through the instructions and got everything ready to go. I must admit, when I returned to check on my dishwasher, I found that it had overflowed! I could not figure out what I had done wrong but I then realized what had happened – I had overlooked one of the important instructions! I had put the dishwasher on a “short cycle”, which the instructions clearly say NOT to do! So learn from my mistake – make sure you follow ALL of the instructions. That being said, the dishes looked amazing! They were clean and bright and they cleaned all my caked-on items well. I was really impressed! Having learned from my mistake as well, I’ve since used the FINISH Quantumatic Dishwashing Detergent Dispenser to clean my dishes to a high standard AND kept my floor dry! I also received Finish Jet-Dry Trubo Dry, which I have used frequently in the past. I really like this product because it removes watermarks and leaves my dishes spot-free — another time-saver that I really appreciate! 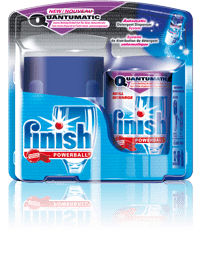 I have used the FINISH Quantumatic Dishwashing Detergent Dispenser and Jet-Dry Turbo Dry together numerous times since my first faux-pas and I have found that they save me tonnes of time and energy! 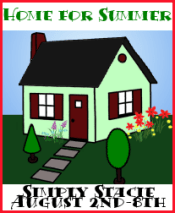 I’m a huge fan now and plan on making them regular items in my household! You can buy the FINISH Quantumatic Dishwashing Detergent Dispenser at numerous retail stores and they sell for approximately $9.99 for a dispenser and a refill with 12 washes and Jet-Dry Trubo Dry sells for approximately $4.49 (prices may vary). QUANTUMATICâ„¢ has been tested extensively in a variety of dishwasher models and wash cycles. However, QUANTUMATICâ„¢ is not designed to work in short cycles or “rinse only” cycles, which are too brief to activate the dispenser.